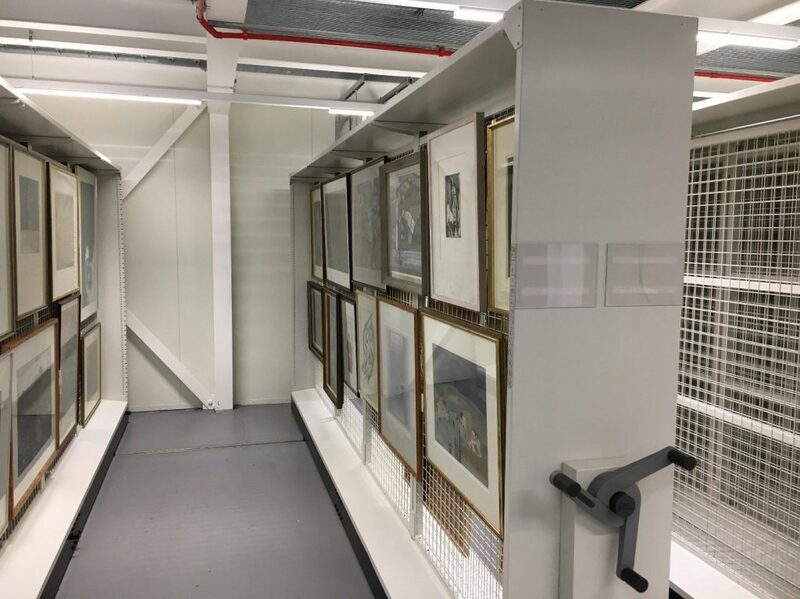 This week’s blog comes from Project Collections Assistants, Anna O’Regan and Stephanie Allen, who assisted the Museum Collections Team with a large scale move of artworks by Edinburgh College of Art students to a new collections store at the University Collections Facility (UCF). Supervised by Museum Collections Manager, Anna Hawkins and Preventive Conservator Katharine Richardson, the primary focus of this project was to surface clean the artworks before they were relocated. When we arrived at the UCF for the beginning of this project, the artworks were stored in a less than ideal location; placed on open shelving, they were exposed to the accumulation of surface dirt. This project facilitated their move into a closed, environmentally controlled storage facility which was built specifically to house the University’s Museum and Art collections. 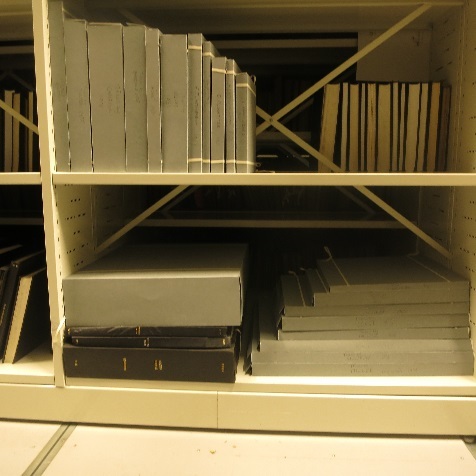 As the Rationalisation Projects Conservator my role is to make sure that the risk of damage to the objects which are housed at the UCF is minimised during the project. It is my job to make sure that the objects can be safely handled by the cataloguing team and any readers who come to visit. I am currently working on a collection of maps and atlases which date from around 1840. Many of these objects are beautifully illustrated and are an excellent example of the craftsmanship of the time. I have been recently employed by the University of Edinburgh on a 12-month contract as a Projects Conservator. This exciting and varied role means I am predominantly located in the University Collections Facility (UCF), and off-site storage building in South Gyle. I will be working within the rationalisation project, looking at the collections which are currently housed there, such as rare books and university archives. I will also be assisting the musical instrument conservator and art department in their work. This will consist of carrying out conservation work and supervising volunteers under the direction of the Preventive Conservator, Katharine Richardson.